Today, as part of Ailsa’s weekly travel theme ( Where’s My Backpack ), we are heading to Chiang Rai in Northern Thailand and entering Wat Phra Kaeo, the Temple of the Emerald Buddha. This week’s theme is Glow. 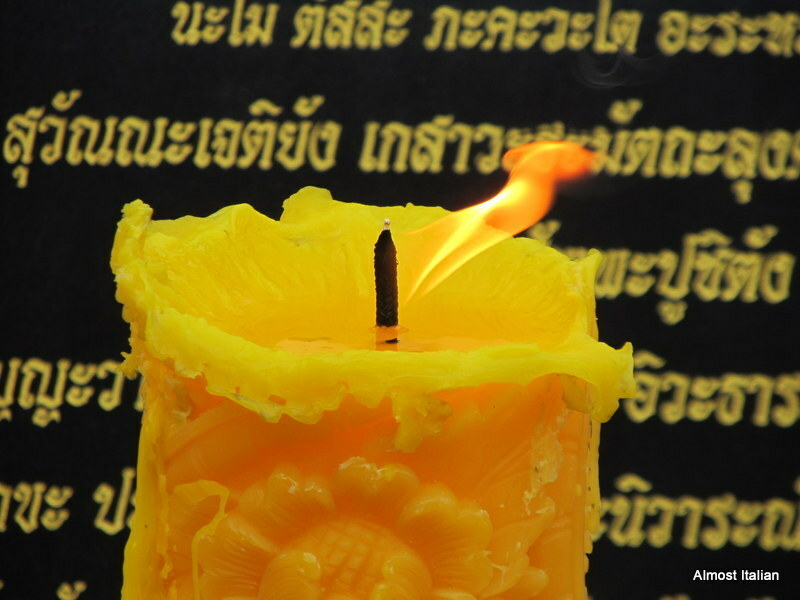 A candle is lit for for contemplative gratitude and inspiration. 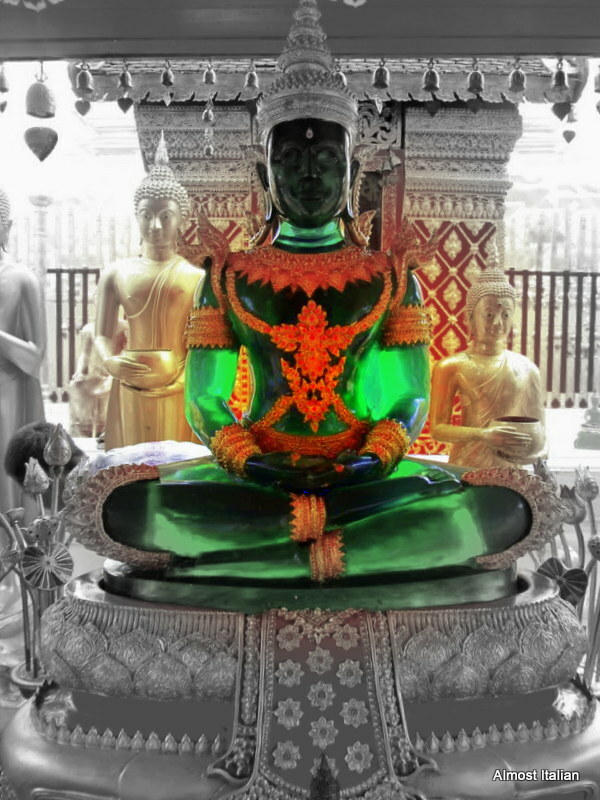 The Emerald Buddha glows with pure Jade. Travel Notes: Chiang Rai’s Temple of the Emerald Buddha claims to be the ‘original’ Wat Phra Kaeo, at least in Thailand. In 1434, lightning struck the chedi (since restored) and cracked it open. The ‘Emerald Buddha’ was found inside the broken pagoda. Soon after its discovery, the sacred image was moved to Lampang, then Chiang Mai, then Laos and finally to Bangkok in 1778. The ‘Emerald Buddha’ is actually made of jade. In 1991 a replica of the original was commissioned to honor the Princess Mother’s 90th birthday. A large hunk of Canadian jadeite was donated by a rich Chinese businessman, and the replica was carved in Beijing. Following Buddhist protocol, the new ‘Chiang Rai Jade Buddha’ is not an exact copy of the original. It’s slightly smaller with other variations. The new Buddha was installed in a custom-built pavilion at the back of the main compound. I bought a green resin copy for the kids, so taken with the colour. I might purchase another green resin one next month when I head back to Thailand. It certainly is glowing, very beautiful. I’ve never seen anything like it. What an incredible buddha! And pure jade too. It looks lit from within. The glowing jade is fabulous – what great photographic skills you have! Previous Previous post: Anzac Day 2014. Commemorating Slaughter with a Biscuit? Next Next post: Garden Monthly. May 2014.